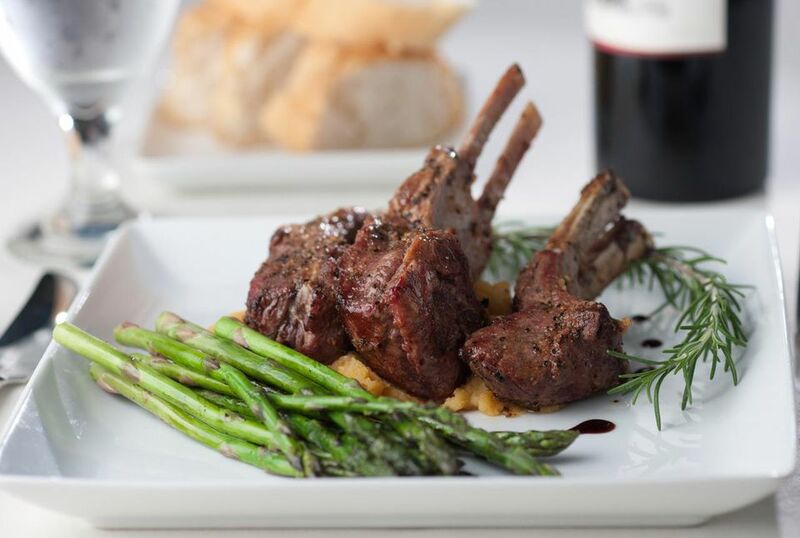 This succulent rack of lamb is roasted and served with an easy red wine and herb pan sauce. Use a good quality red wine for the sauce, and use fresh herbs if possible. This lamb makes a fabulous meal for a special occasion. Serve it with mashed potatoes and steamed or roasted vegetables. Roasted Brussels sprouts or steamed green beans are excellent choices. Heat oven to 400 F (200 C/Gas 6). Sprinkle the lamb with salt and pepper. Heat olive oil in a large heavy skillet — preferably an oven-safe skillet — over medium-high heat. Place racks of lamb in skillet, meaty side down. Sear the lamb until nicely browned on all sides, letting the racks support each other. Transfer the skillet to the oven and roast the lamb for about 20 to 30 minutes. Remove the racks to a platter, tent it loosely with foil, and keep warm. Place the skillet over medium heat and add the shallot or onions to the drippings. If necessary, add a tablespoon or two of olive oil. Cook, stirring, for 3 to 4 minutes, until tender. Add the wine and herbs; boil until the wine has reduced by about two-thirds. Add the beef stock and continue to cook over medium heat until reduced to about 3/4 cup. Cut lamb into portions and serve with the red wine sauce. The minimum safe temperature recommended by the USDA for lamb is 145 F or 160 F for ground lamb. That temperature would be medium-well. If you prefer a different temperature, here's a guide to temperatures (before any resting time).